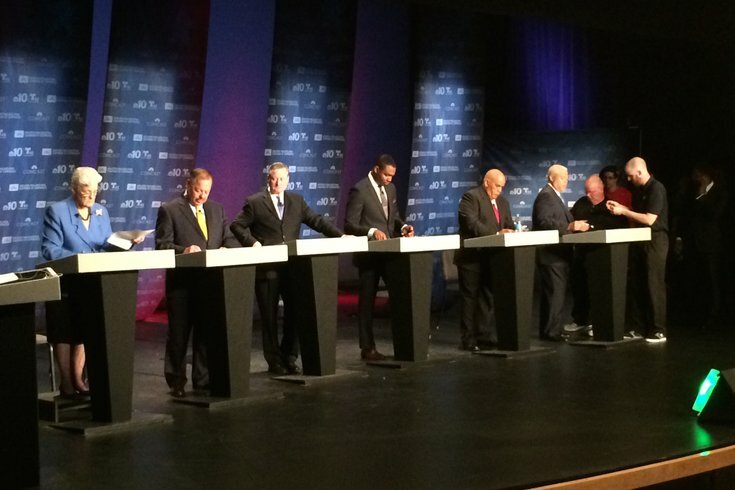 The six Democratic mayoral candidates prepare for their first televised debate, held at the Kimmel Center. Today is the last day to register to vote in the May 19th primary election in Philadelphia. On that date, voters will pick their party's nominees for mayor, city council and several other public offices. In addition to political offices, there are also judicial races on the ballot, including openings on the state Supreme Court. In Philadelphia, where voter registration skews heavily Democratic, candidates who win that party's nomination are often well positioned for victory in November. The last Republican mayor, for example, was elected in 1944. Or you can visit the county board of elections, which is located in Room 142 of City Hall. In addition to showing up in person, an individual can send in their registration by mail, which must be post marked by Monday in order for it to be valid for the upcoming primary. This year’s local election does not feature national candidates. In years where there are only local candidates on the ballot, turnout is historically much lower. Turnout is usually low when incumbents are up for re-election. For example, during the 2011 primary, when Mayor Michael Nutter was running as an incumbent, turnout was roughly 20 percent. When the mayoral field was wide open in 2007, turnout was close to 40 percent for Democrats, according to philly.com. In order to register, an individual must be at least 18 years of age, a U.S. citizen and a resident of Pennsylvania for at least 30 days before the election. And for an individual to vote in the Democratic primary, they must be registered with that party. Unsure if you are registered or which party you are registered with? The state has a website that can show you what it has in its files. In addition, a sample ballot can be viewed here.